The Phillies have reached an agreement on a three-year contract with free-agent outfielder Andrew McCutchen. For almost 10 years, Andrew McCutchen was the face of the Pittsburgh Pirates. With the Phillies, he will be a supporting actor. MLB winter meetings: What moves did the Phillies make? “More of a complementary veteran now,” one National League scout texted. But that doesn’t mean McCutchen can’t help the Phillies, who reached an agreement with the outfielder on a three-year contract Tuesday, a league source confirmed. The deal, which is pending the completion of a physical, is reportedly worth about $50 million. McCutchen, 32, likely will play either left field or right. He has lost a step in center field and hasn’t played there full-time since 2016. But he essentially replaces first baseman Carlos Santana in a Phillies offense that will make more positional sense than it did last season and remains primed to add its centerpiece — either Manny Machado or Bryce Harper — later in the offseason. A few years ago, McCutchen was mentioned along with Machado, Harper and Josh Donaldson as part of the megaclass of free agents in 2018-19. But after slashing .313/.404/.523 with 100 homers from 2012-15 — a four-year stretch in which he posted four top-5 MVP finishes and won the award in 2013 — McCutchen’s production dropped off. Over the past three seasons, he has hit .263/.356/.446 with 72 homers. But although McCutchen is no longer an MVP-caliber player, he remains a durable one. 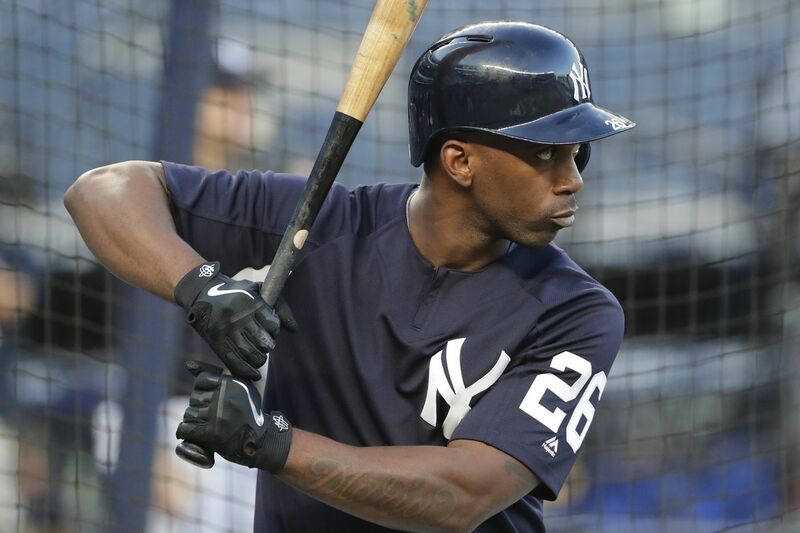 He has played at least 146 games in each of the last nine years, including 155 last season between the San Francisco Giants and New York Yankees in which he hit .255/.368/.424 with 20 homers and 14 stolen bases. It was McCutchen’s health and reliability that vaulted him ahead of fellow free-agent outfielder Michael Brantley in the Phillies' estimation. While Brantley had a better season than McCutchen last year, he was limited to 11 games in 2016 and 90 games in 2017 because of various injuries. The Phillies also believe McCutchen’s offense will get a boost from playing his home games in Citizens Bank Park after spending the majority of his career in pitcher-friendly parks in Pittsburgh and San Francisco. Indeed, McCutchen ranked 20th in the majors last season in on-base percentage (.368) and swung at only 19.4 percent of pitches out of the strike zone, the second-lowest rate behind Cincinnati's Joey Votto. McCutchen also saw an average of 4.24 pitches per plate appearance, tied for ninth in the majors. Rhys Hoskins (4.42) was first, while Cesar Hernandez (4.25) ranked eighth. Andrew McCutchen's plate approach is similar to what the Phillies got out of Carlos Santana -- he's able to work deep counts. One of the scouts suggested McCutchen's offense is a step down from Santana's, even though Santana had a lower on-base percentage (.352) and OPS (.766) than McCutchen last season. Santana has more power, but stylistically, they're similar in their ability to work deep counts and reach base consistently. As an outfielder, McCutchen fits better in the Phillies' lineup than Santana, whose departure in the Segura trade enables Hoskins to move back to his natural first base. Two scouts also noted McCutchen's reputation as a positive clubhouse presence. Regardless of the other moves they make this winter, the Phillies will remain one of the youngest teams in baseball. A veteran such as McCutchen could serve as an example for some of those impressionable players. The Phillies made an aggressive bid to trade for Machado during the All-Star break and likely have placed him atop their offseason wish list. After trading for shortstop Jean Segura last week, they would have to talk Machado into playing third base, his best position but one he prefers less than shortstop. But with the Yankees likely to pursue Machado — and Machado is believed to want to play for the Yankees, even if it means moving to third base — the Phillies could still pursue Harper to play right field, put McCutchen in left, and trade one of their young outfielders, likely Williams. The Cleveland Indians, who reportedly have made right-handers Corey Kluber and Trevor Bauer available, are seeking outfield help.